hard to photograph a black dog. 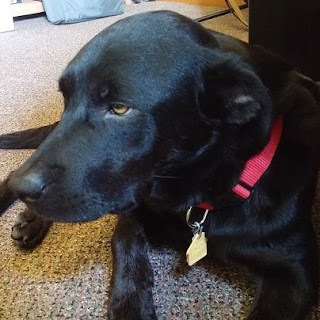 Silent Sam and I recently adopted a rescue dog from the Chicagoland Lab Rescue organization. Sadie is about two years old and is afraid of everything. There is some part of her that is a Lab but we are not sure exactly what part. She is better than she was when she got here but she obviously will need a lot of love and consistency to bring out all her good qualities. When we have adopted dogs in the past, we have also had children in the house so the new dog never got as much attention as Sadie has had. It could be said that she is a bit spoiled. Not terribly but we have never allowed a dog to sleep in our room before and somehow Sadie has a bed on the floor in our room. When I sat down to write this post today, I was thinking about Sadie and I wondered about dogs and diabetes. I remembered that there are dogs trained to help people with diabetes. In looking up information about it, it seems that some dogs can just naturally smell the chemical changes in a person with diabetes and can alert them to either highs or lows. 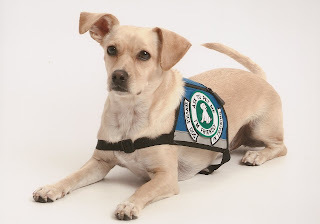 There is an organization named Dogs for Diabetics trains dogs and handlers to work together so that the handler is warned about diabetic highs and lows. There are many stories of how much the dogs have given handlers back their life. It gives them the chance to get back out doing things without worrying as much about their diabetes. If you know someone whose world is growing smaller because of their diabetes, this organization might be able to help. There was even a story about a dog diagnosing another person in the handler’s office. The woman told the handler that the dog kept pawing at her knee. The handler checked the woman’s glucose level and it was high. The woman went to the doctor and was diagnosed with Type 2 diabetes. Dogs truly can be man’s best friend.